ASM #50 begins another cycle of the Spiderman saga. As in ASM#17-18, Spidey is in a fight when Aunt May takes ill. Once again, Peter decides to discard his uniform. Once again, the gangs start operating the minute it becomes obvious the friendly neighborhood Spiderman is out of business. But the issue does bring one big new aspect to Spiderman: the Kingpin makes his first appearance. One of the most enduring villains in the Spiderman and Daredevil rogues gallery, he decides to take over the mob in New York City. But when Peter sees a guard about to be killed by mobsters, he can't hold back, even though he doesn't have his costume. He goes into action, quickly subduing the gang and getting away before he can be seen. Afterwards, he remembers that it was his failure to stop a criminal that resulted in Uncle Ben's death. Aunt May and Uncle Ben are the hammer and anvil Peter is continually suspended between. If he plays his Spiderman role too long, he's neglecting Aunt May; if he ignores the Spidey aspect too long, he's not living up to his obligation to Uncle Ben. This tension between the two aspects of his character is what makes him so memorable. Peter is not the only person torn between his past and his future. Frederick Foswell, the ace reporter who had previously been a mob boss (in ASM #10), is apparently tempted to resume a life of crime. He tries to take over the Kingpin's position, but is casually brushed aside. Apparently the Kingpin is smarter, stronger and faster than he looks. He imprisons Foswell and captures J. Jonah Jameson, whose editorials against the crime boss are causing problems. In ASM #52, Spidey and JJJ are about to be killed, but they survive thanks to Peter's strength and quick thinking. However, this does not impress the newspaper magnate. Spidey and the Kingpin battle, while Foswell tries to save JJJ from the rest of the mob. In the end, Foswell is killed and the Kingpin gets away. Comments: A superb mini-series, among the best of the Lee-Romita stories. Foswell becomes the first, but by no means the last, long-running character to die in ASM. The other major deaths in ASM to this point had been Uncle Ben, Betty Brant's brother and the Crimemaster, all of whom died in their initial story arc. Foswell on the other hand had been around since ASM #10. The DD series began to hit its stride in these issues. For starters, each issue featured a new villain. In #3, DD first faced the Owl, who would be a longtime foe. In #4 we first met the Purple Man, an intriguing character who could convince anybody to do anything by force of his personality. Although the villain in DD #5, the Matador, was not terribly interesting, the artwork, which had been handled by Bill Everett in the first issue and Joe Orlando in #2-#4, was turned over to Wally Wood. Although Wood did not last long, his influence on the character is undeniable. On the romance front, it becomes obvious in these issues that Foggy is pursuing Karen romantically. This adds for an additional dimension to the usual "if only I dared tell her that I love her" that was a staple of the Marvel superheroes of the time. Now Matt has to feel guilty about being in love with his best friend's girlfriend. Daredevil first appeared in April 1964, in Daredevil #1. He was something of a new concept; a handicapped superhero. True, Don Blake was lame, but that disappeared every time he turned into the Mighty Thor. Daredevil was blind, 24/7. We learn his origin in that first issue. Matt Murdock was the son of a prize fighter. The old man, known as Battling Murdock, was determined that his son should get an education. However, as Matt prepares for college, his dad's career is on the skids. The only manager who will handle him is known as The Fixer. But Matt's life takes a sudden turn when he saves a blind man from being run down by a truck. The truck was carrying radioactive materials which hit Matt in the face, blinding him. However, he also discovers that he has gained incredible agility and his other senses (especially his sense of hearing) have become stronger. 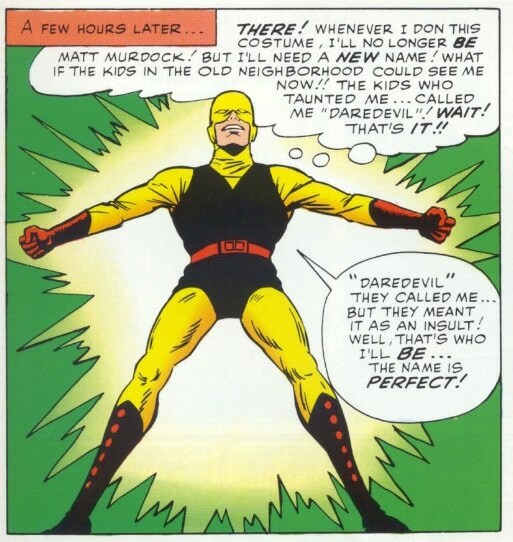 This of course, makes Daredevil yet another Marvel 1960s superhero who gained his powers from radiation, like Spiderman, the Fantastic Four and the Hulk (and many villains as well, including the Sandman). Meanwhile, his father's career has suddenly taken off. But, true to his name, The Fixer has been arranging for other fighters to take a dive against Battling Murdock. Now that the big fight is here, it's Dad's turn to lose. But with Matt in the stands he kayos the opponent, angering The Fixer, who has him gunned down in retaliation. The yellow part wouldn't last long; perhaps it was seen as inappropriate for a character dubbed "The Man Without Fear". Which was another oddity about DD; all of Marvel's characters had a name like "The Mighty Thor" or "The Amazing Spiderman" or "The Incredible Hulk", but Matt Murdock was "Daredevil, the Man Without Fear". DD #1 also introduced Matt's buddy Foggy Nelson. The two start up a law practice together and their secretary, Karen Page, becomes the love interest. In DD #2, Stan pitted him against Electro, who had previously appeared in Spiderman #9. 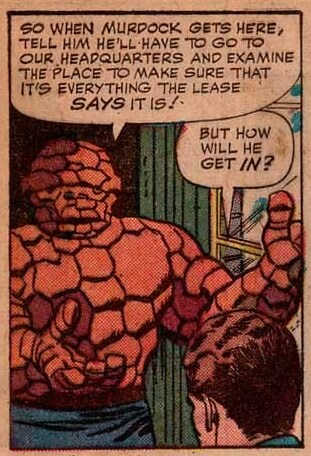 This was one of many smart things that Marvel did in the 1960s. Although DC had done superhero crossovers for years, especially with the long-running Batman/Superman teamup in World's Finest, the villains tended to remain pitted against one superhero. This gave Marvel a distinct edge. Not only did they have to invent fewer villains (at least at first), but they could capitalize on the popularity of Spiderman and the FF by hiring out their villains. Yeah, okay, my blind partner will come out and inspect the premises. As we have discussed, the Inhumans saga ended (temporarily) about six pages into Fantastic Four #48. 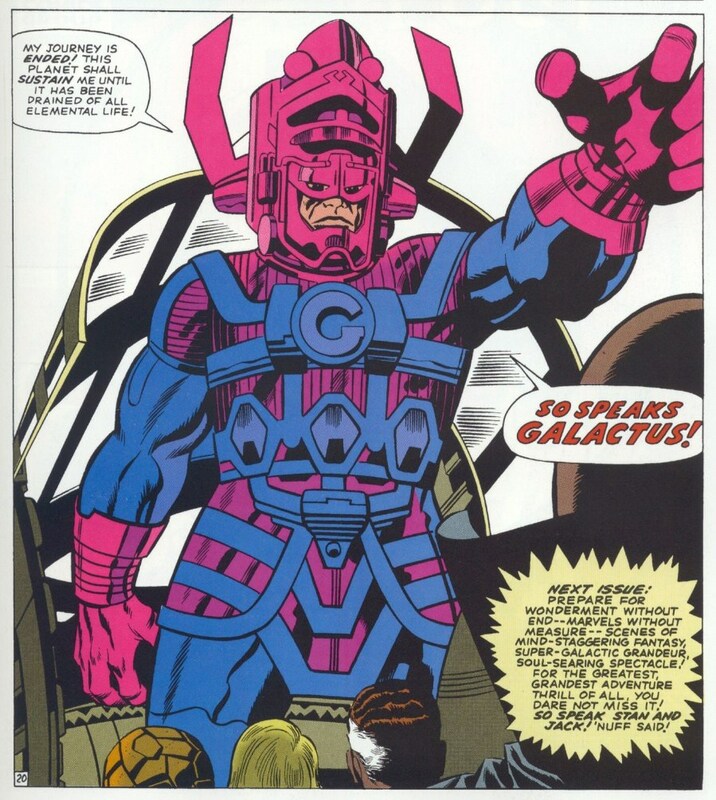 But that issue was also significant for the first appearances of the Silver Surfer and Galactus. The inspiration for the former is pretty obvious. This was the mid-1960s and there was nothing cooler among teens than surfing. Believe it or not, I actually got up on a board a couple times while visiting my cousins on the Jersey shore; the main impression I got was how fast you went; it was definitely a thrill ride. As the FF returns from the Hidden Land after their encounter with the Inhumans, they discover that New York is covered with a fiery sky. What is going on? We also see the Silver Surfer for the first time, looking through the universe for a particular type of star and a particular type of planet orbiting that star. The Thing has punched the Silver Surfer away from the Baxter Building, but in the grandest tradition of coincidence, he lands atop Alicia Master's skylight. She treats him with kindness, and is horrified when the Surfer tells her of Galactus' intentions for Earth. We can see that he is swayed by her arguments. Meanwhile, the Thing and Mr Fantastic have temporarily delayed Galactus' plan to drain the earth of its energy. The Watcher sends Johnny to the home world of Galactus, where a weapon exists that may stop him. And Alicia convinces the Silver Surfer to attack his master in an effort to save Earth. In Fantastic Four #50, we see the battle between the Silver Surfer and Galactus. While the latter is clearly more powerful, the Surfer is not without some ability himself. Meanwhile Johnny is racing back with the weapon from Galactus' homeworld. He arrives in the nick of time and hands off the instrument to Reed. Threatened with potential destruction, Galactus agrees to leave. But first he strips his former herald of the ability to roam among the stars; he will be stuck on Earth. These are terrific issues; at this point the FF was going from strength to strength, with Stan and Jack turning out memorable characters seemingly at will, from the Inhumans to the Silver Surfer and Galactus to the Black Panther, who would shortly make his initial appearance. One of the hazards of comic books is that a writer may pen a story when the future seems far off and then time passes and suddenly that future is 20 years in the past. So it is with the Atomic Knights. They were formed in the dark days of 1986 after the nuclear holocaust that, as you may recall, didn't quite happen. However, this was a terrific series nonetheless. In Strange Adventures #117 (June 1960), we learn that Gardner Grayle is a soldier in an underground bunker when World War III starts, with atomic bombs destroying much of the planet. He teams up with Douglas Herald, a schoolteacher, who's hoping to defeat a local tyrant called the Black Baron. By chance, they discover that a set of medieval suits of armor blocks the radiation from the Baron's rayguns, with which he has been keeping control of the local citizenry. 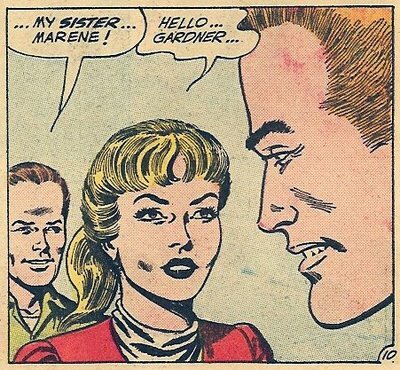 Of course, Marene and Gardner become an item, and following their deepening romance is one of the real charms of this series. In the origin story, the Knights attack the Baron's stronghold, but it turns out that in addition to the rayguns he's got an old rifle. Gardner is unsure that his armor will hold up to a bullet, but at the last moment he is saved by one of the other knights, who pushes the Baron aside, causing him to shoot wide. Gardner later discovers that his savior had been none other than Marene, who had managed to fit into the remaining suit. The story continued every third issue of Strange Adventures over the next several years. Each was written by John Broome with superb artwork by Murphy Anderson. The stories tended to move forward sequentially; for example, in one story the Knights were attacked by Giant Dogs, but after taming them that issue in later ones the dogs were helpful. The stories also featured the Knights traveling to different locations in what remains of the the US, with titles like "The Cavemen of New York" and "The Lost City of Los Angeles" and "Danger in Detroit". The series continued like clockwork until Strange Adventures #160 (Jan 1964), when the final instalment appeared. There was no announcement at the time that the series had ended. I suspect that what happened was that Murphy Anderson had been assigned to replace Joe Kubert on Hawkman effective with Mystery in Space #87 (Nov 1963), and that Atomic Knights just didn't fit into his workload any longer (remember that Anderson was one of DC's top inkers in addition to his fine pencils).